colour : Light to dark green, grayish-green, black. Some rarer varieties are white, yellow, brown, pink and purple. mentally and emotionally a great piece to use when there is excessive anger or frustration, gently removing and dissipating the energy. 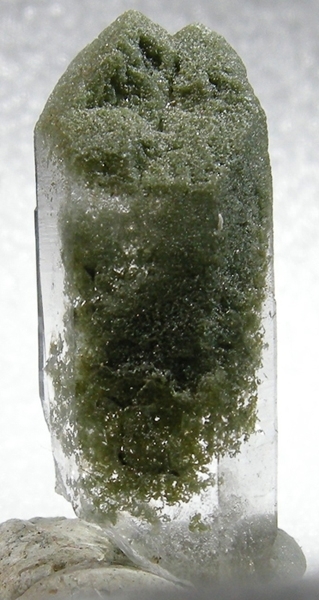 Chlorite in Quartz will help to resolve issues of the heart and remove blockages and resistance that will allow one to acknowledge, forgive, release, and move forward. Being a nature mineral Chlorite is also a wonderful stone to use to cleanse the environment its that breath of fresh air again especially useful in a grid for a sacred space, healing room or home/office. 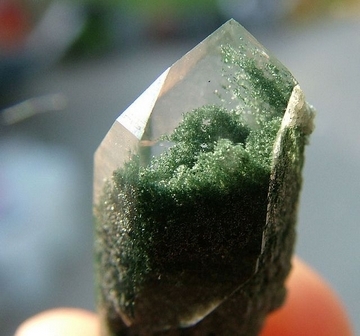 With Quartz, Chlorite can help to clear negativity. during my continuing research i have found It is recommended to use a Quartz with Green Chlorite or a natural Quartz with Green Chlorite point placed point down in the toilet tank to energetically cleanse an entire home. im not quite sure about the thinking and feeling about this. water yes is a amplifier and superconductor for crystal energy, in my home the tank is placed on the outer most wall of the house i really cant see how this would cleanse my home effectively i also feel the water would become charged but then you would just be flushing it away great for the water system but not so great for your home, of course some of us have more than one loo but again i personally feel this isnt very respectful for the crystal ,of course this is my own personally feelings on this and im not saying anything is wrong or right as always trust your own intuition. Used with Amethyst, you can get rid of energy implants you do not want and heal the void left by the removal . These two crystals together are also useful against psychic attack.